I received the below through my personal email this morning, it’s obvious spam, and perhaps even more obviously a phishing attempt. 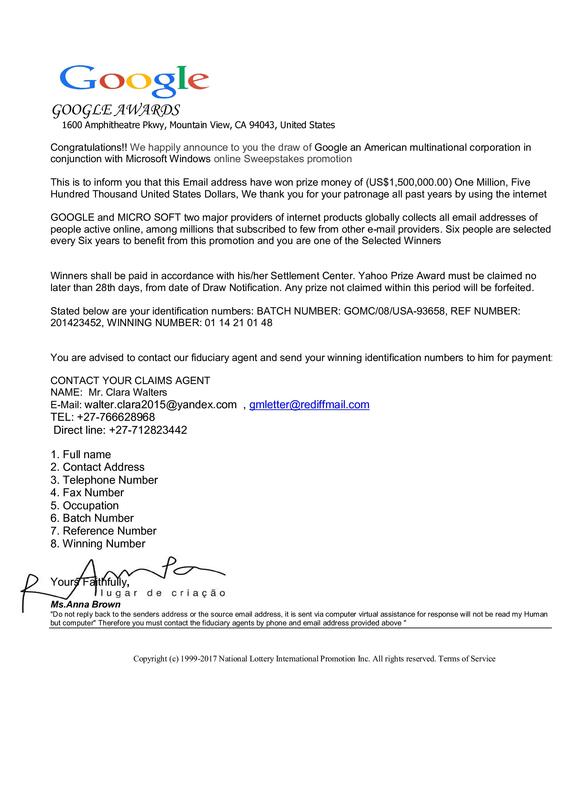 The image is sent instead of text, as the text contained within cannot be scanned by automatic systems for the scammy content it contains, but the intent is clear to anyone reading the content, it wants the reader to believe that they’ve won money. They want the reader to contact them to get the money, and then they want the reader to give them some money to authorise payment, or to pay lawyers to deal with the taxes due or some such excuse. What they want is the reader to believe that to get access to millions, they need only hand over a few hundred dollars, a small amount in comparison. You’ll never get any money, but if you pay the first amount of cash, they’ll continue to milk you for every penny they can get, with follow up fees, banking charges, etc, etc. They’ll pretend to be lawyers, and bankers, and hell they’ll even eventually pretend to be police who need a small fee to return your stolen money to you. They’ll set up different email addresses, pretend to be in different countries and try all sorts of tricks to keep the cash flowing, hell they’ll even ask for the price of airline tickets so they can meet with you at the airport and deliver the cash personally. In the worst cases, they’ve arranged for their prey to visit their home countries, often in Africa or the former Soviet states, and people have actually been kidnapped and ransomed back to their families for the last bit of money. If these criminals go to these lengths to pretend to be different people, and try all sorts of tricks, why is the text on the email so bad. They claim to be representing Google and Micro Soft (notice it’s two different words not the singular Microsoft, that the company actually uses), but their using a yandex email account (a chinese search engine company), and the text mentions that the Yahoo prize award needs to be claimed, and then in the blurb at the bottom of the page, it’s the National Lottery International Promotion (is it National or International, they don’t seem sure). So which company are they actually from? Yahoo? Google? Micro Soft? Yandex? And the mistakes don’t end there, the prize must be claimed in “28th days”, the agent you’ve to contact is Mr Clara Walters, and the address is in California, but the phone code is +27, which connects to South Africa. And while I’m certainly in no position to comment on people’s handwriting, the signature seems to have the initial R, and the Surname seems to start with an A, but the name given is Anna Brown, which even the most generous reading wouldn’t match the two together. These criminals aren’t native english speakers, and to give them credit, they’ve done a better job of making a fake letter in english, than I could in their language, but it actually seems that they leave these mistakes on purpose. Because anyone who doesn’t see these mistakes, and isn’t being very skeptical by this point, is more likely to fall for their scams and tricks. Sadly those who are most vulnerable are those who probably are the most likely to fall for them, and the least likely to be able to afford to be scammed in this way. So what should I do! Let people know about these scams, warn people, show them scams you’ve received (like I’m doing), and make it easier for people to recognise the signs and to protect themselves from the scammers and criminals. Previous PostPrevious What should you Tweet?